Last week I wrote about my trip to the San Francisco and Bay Area and the culture of high-tech innovation that is flourishing there. Today I will follow up with a few random thoughts about entrepreneurship and the role that universities play in this world. 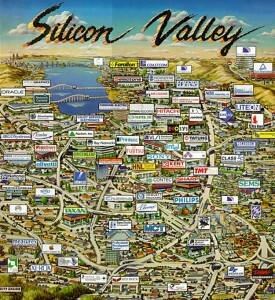 There is no doubt that entrepreneurship and start-up companies are huge in Silicon Valley. 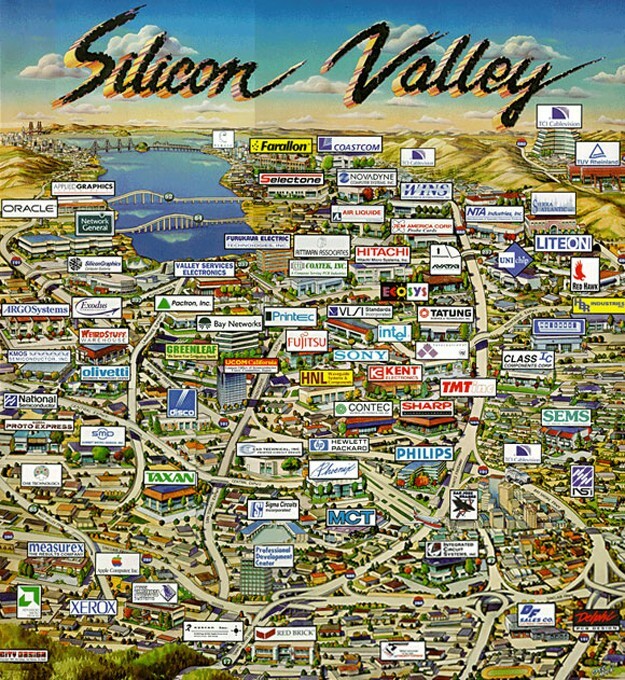 There is a whole eco-system of universities (most notably Stanford), venture capital, incubators, and a wealth of engineering talent to keep the Valley humming. Everybody and his brother has some venture going, in fact you’re nobody if you’re not trying to create some new business. It’s as if, in southern California, everyone is out trying to hawk their amazing screenplay, and in northern California, everyone has an idea for an Internet start-up that they will pitch to anyone who will listen. Everyone is aware of the meteoric rise of Apple, Google, and Facebook – Steve Jobs has become a cultural icon – and the prevailing sentiment is, there is no good reason that I can’t do the same thing and become a bazillionaire with my fantastic disruptive technology. But back to matters at hand. The culture of entrepreneurship which has taken California by storm and has become part of the national conversation, is having a big impact on engineering programs, especially in electrical engineering and computer science. It is now clear that starting a company is now one of the options available to young engineers, right alongside getting a job at an established company or going to graduate school. The question is, what can we do, and what should we do, as educators to prepare students for this brave new world? Michigan Tech is addressing this question head-on. We have established a Center for Entrepreneurship and Innovation, precisely to help students learn about project management, innovation, entrepreneurship, and business practices in the high-tech environment. Students from all different disciplines have the opportunity to participate in the Center, and indeed it played a role in the “Silicon Valley Experience” that I described last week. The Center is getting a lot of attention from philanthropically-minded alumni, and rightly so. I expect it to be a big success, and a big draw for new students coming to Michigan Tech. That being said, my personal answer to what we should be doing for our students is a little bit different. I have to admit, straight up, that I do not know that world very well (OK, at all) and therefore I really can’t be of much help. I fully support my colleagues and our good friends who want to support this activity, but for the most part they are going to have to do it without me. Maybe someday I’ll have a great idea and try to start a business, but it hasn’t happened yet, and I shouldn’t be telling students how to do it until I do. (That’s not entirely true – for a while I owned a business in Missouri called “Tropical Entertainment” that was the business front for a salsa band that I played in. But that’s a story for another column.) My skills are much better put to use helping students learn the fundamentals of electrical engineering, and supporting my faculty so that we can be the best ECE Department that we know how to being terms of education and research. The other point I have to make about going “all in” with entrepreneurship is that, as exciting as it sounds, only a small fraction of our students are ever going to give it a shot. The vast majority of our students are going to work for an established company as an engineer, and they are going to be very good at it. The 300+ companies that come to campus to hire our students are well aware of this. Taking this a step further, I’m not going to throw all those corporate recruiters under the bus by telling them that our main goal is to train students to start their own businesses. People study engineering for all sorts of reasons. Our mission should be to prepare students in electrical and computer engineering, so that they can go out into the world, practice their trade, and make a decent living. What they do after that is up to them. Starting a business is one of the options, to be sure, but the truth is that most of them will practice their engineering by working for someone else, and that’s perfectly OK with me. My last point today has to do with the issue of when is the best time to get into the entrepreneurial game. As I stated above, I am supportive of my colleagues who want to bring that down into undergraduate educational programs. Where I draw the line, however, is in substituting business and entrepreneurship for hard-core engineering at the undergraduate level. There is a time and a place for everything, and let’s face it, the best time to learn science, math, and engineering is when you are young. Young brains are just ready for it. Those same brains may not be fully developed for mature social interactions, but that’s OK, there is time enough for that later. Business, management, leadership, entrepreneurship – these are domains that require knowledge of working with people as well as working with things, and for many that knowledge comes with a few extra years. My advice to students is, before you get stars in your eyes, LEARN ENGINEERING FIRST. It will serve you well later, no matter what you do. As a case in point, I look at all of our very – and I mean very – successful ECE alumni who have had fabulous careers as business leaders and entrepreneurships, and are promoting entrepreneurship on our campus so heavily. Ask them what they were doing when they were 22 years old, and the answer is uniformly the same – they were working as engineers. Am I the only one who sees the irony in this situation? Engineering education and engineering practice at a young age is the best launch pad for anything our ambitious students want to accomplish in life. So again, I fully support my colleagues who seek to bring exposure to entrepreneurship into our undergraduate curriculum; I think it’s great and very forward-looking. For my part, I’m going to keep doing what I do best – building educational programs for students that I fully expect to be among the very best electrical and computer engineers in the country.